Steel buildings enjoy an increasing popularity in the worldwide construction industry. They outdo traditional buildings in terms of cost-efficiency, strength, set up time and durability. The growing tendency is explained by steel’s unique features that provide buildings with a range of crucial advantages. Steel ensures high resistance against extreme weather, which prevents virtual restoration expenses related to damages caused by wind, storm or fire. Being less exposed than wood or concrete, it can last for decades without maintenance needs, entailing a structural warranty of 20 to 40 years. 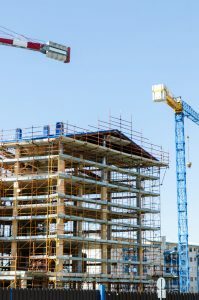 Also, building’s erection is fast, given the pre-engineered metal components that are easily assembled at the construction site. Apart from these fascinating upsides, adjustable steel panels, used at construction, can be flexibly combined to reach various forms and structures. This allows different designs to be available, and serve a whole host of applications and customer’s special requirements. The steel building designs used primarily in the construction industry are: straight column, modular span, single slope, added lean-to, and side canopy. This standard design implies that the entire building is framed by a single column, which endures its own weight and requires no supporting elements from inside. A clear span building provides an open interior area with a maximum space for equipment and commodity storage. The clear span structure is not recommended when the steel building is wider. In order to withstand the overall load, steel components gain in size and weight. In this case a modular span design is chosen. Modular buildings have interior columns that are meant to give additional support and distribute equally the construction load. Depending on how much wider the building gets and the toughness level of the steel, there are 3 types of modular span. 1 Row modular span involves a single row of columns that centrally traverse the building across its length. Another option is to install two rows of columns that run on trajectories equally distanced from the central line. In case of very wide and heavy buildings, three rows are required to meet the safety standards. In a single slope building the eaves of each sidewall are made of different heights. This creates an one-way roof that facilitates the effortless drainage of water and snow. Targeting changes only in the roof design, single slope buildings can be framed, following both straight column and modular span standards, depending on size and weight. Lean-to buildings are auxiliary structures that are attached to the main building, serving as a multi-functional extension. They have a single slope roof and rely on the partial support of the adjoining building. These light structures are clear span, and offer a completely free space for various needs. A canopy is a steel building without walls. It is attached to the main structure by a special roof extension system. The over-hanged roof provides an aesthetical plus, as well as a functional covered space. Altogether, steel buildings are unique structures with many benefits over the traditional constructions. The prefab components make it easy to assemble the building according to different designs able to meet all kinds of application and personal needs. How Much Can You Save With Used Industrial Shelving?